Rise of the Tomb Raider Sequel Leaked | Nerd Much? 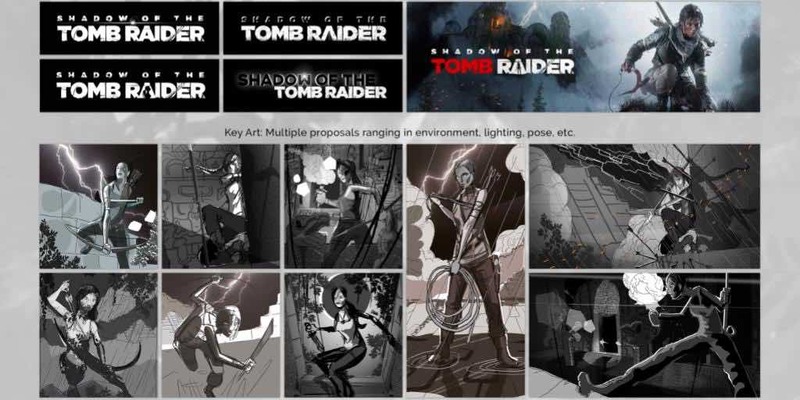 Leaked from a marketing studio that Square Enix often works with, Takeoff Creative, are a few sketches and logo designs for the yet to be announced sequel to Rise of the Tomb Raider titled Shadow of the Tomb Raider. These are designed to be varying concepts for promotional materials, such as poses and logos. The image has since been pulled from the Takeoff Creative‘s site, but was preserved via a cached version of the site and NeoGAF. The statements don’t give away much, only really making it clear that these sketches are concepts only for future promotional materials. The images themselves, as “pillars of the game” do reveal a bit more. For example, the weapons Laura is wielding include a small sword, machete, and a spear. The background shows a rather generic tomb, with snake head statues and a goddess statue that could be from a few ancient civilizations. One of the center images, with the bamboo and rising sun in the background is reminiscent of a vague Japanese theme, but the Tomb Raider game on the PS4 already sampled that. It seems unlikely the developers would do it again. No real clues as to what the game will be about, but we are sure to hear more later this year from Square Enix themselves. Hopefully, they will confirm the title and a trailer if we’re really lucky.